Kyran Moore returns a punt for a touchdown for the Roughriders. The journey from Regina back to Saskatoon after the Labour Day Classic always feels like the longest two-and-a-half hour drive home. Around 9:45 a.m. on Monday, I began my jaunt up Highway 11 to return to “The Bridge City” from “The City that Rhymes with Fun.” To my surprise, a halt had been made on two construction projects on lengthy parts of that roadway and traffic was light. I made good time getting home. I should underscore that I am happy with living in Saskatoon. Overall, I have had a pretty good last four years there. I always take the end of the Labour Day Classic weekend as the moment summer officially comes to an end. The Labour Day Classic weekend is a great party weekend, and it always feels like a letdown, when it is over. When it concludes, your thoughts begin to dwell on returning to the rigors of regular life. You wish the Labour Day Classic weekend would never end, or that every weekend could be the Labour Day Classic weekend. Winnipeg and Saskatchewan fans enjoy the Labour Day Classic. On the Mosaic Stadium turf during Sunday’s CFL clash between the Winnipeg Blue Bombers and host Saskatchewan Roughriders, the Roughriders pulled out a 31-23 victory. As I was cheering for the “green and white,” it was a good day. With that said, it would have been a good day and weekend had the Roughriders not won. For those that head to Regina for the Labour Day Classic weekend, they realize the rivalry between the Bombers and Roughriders is a friendly one. Every year, you look forward to getting together with the crew of Bombers fans that travel from Winnipeg to the Saskatchewan capital for this game. A number of the Winnipeg fans make this trek on an annual basis. “The Golden Boy” rallies Bombers fans before the Labour Day Classic. During both nights out, everyone had a good time and everyone treated each other with respect. Good-natured jabs went back and forth between the fan bases regarding the two teams, but that is part of the fun of the weekend. The fellowship aspect, sharing a common love for the CFL and showing a fan passion for the team you cheer for are huge overall big things you always look forward to. It always seems like a disappointment when that get together ends. One year I need to make the “Banjo Bowl” in Winnipeg on the weekend that follows the Labour Day Classic to see both ends of the annual home-and-home series between the Bombers and Roughriders. It feels like that would be a way to pay back the Winnipeg fans that make it out to Regina every year. This year’s “Banjo Bowl” is slated for Saturday and is sold out. Mascot “Gainer the Gopher” makes his rounds after a Roughriders TD. Since returning to Saskatoon, it seems like social media lines have been buzzing with local area teams trying to spread news about what they are up to. Now that it is September, what I view as the winter sports season that runs from September to April, which gets quite busy, is upon us. It feels like you can drown in the sea of information. Here are some tidbits that locked in my head. Saskatoon products Emily Clark and Sophie Shirley along with Prince Albert product Kaitlin Willoughby will attend Canada’s National Women’s Hockey Team’s Fall Festival that begins this coming Saturday and runs to Sept. 16 in Dawson Creek, B.C. The trio of forwards are part of 59 players that were invited to the annual training camp, which is aimed at helping develop and evaluate Canada’s top female hockey players. The players at this camp are being graded to possibly play on Canada’s senior national team, and the invitees include 23 players who helped Canada win silver at the Winter Olympics held in February in PyeongChang, South Korea. Clark, who is a member of the senior national team, and Shirley, who is member of Canada’s national development team, will both play in the NCAA ranks this season with the University of Wisconsin Badgers. Willoughby, who helped Canada’s women’s team win silver at the FISU Winter Universiade in Almaty, Kazakhstan, in 2017, will play professionally with the CWHL’s Calgary Inferno this season, and she is an alumnae of the University of Saskatchewan Huskies women’s hockey team. U of Saskatchewan staff member Jason Weber will be working as a strength and conditioning coach at the Fall Festival. Kianna Dietz, who is the former “glue gal” with the powerhouse Saskatoon Stars female midget AAA team, has found a new hockey home. The 18-year-old forward will join the University of Lethbridge Pronghorns women’s hockey team in the U Sports ranks for the upcoming campaign. Last season, Dietz recorded five goals and 18 assists in 27 regular season games with the Stars. She played in four complete campaigns with the Stars appearing in 104 regular season games posting 23 goals and 38 assists. The Pronghorns will face the U of Saskatchewan Huskies in a neutral site exhibition match on Saturday in Swift Current. Saskatoon Hilltops defensive tackle Garth Knittig was named the defensive player of the week for the Prairie Football Conference on Tuesday. Knittig had six solo tackles, two tackle assists and a half sack as the Hilltops downed the Rifles in Winnipeg 38-8 to last Sunday. The Hilltops are 3-0 to start the CJFL campaign, and they have won their last 21 straight road games including play in the regular season and post-season. The Hilltops return to action on Sept. 15, when they travel to Calgary to face the Colts. U of Saskatchewan Huskies defensive back Nelson Lokombo was named the defensive player of the week for the Canada West Conference on Tuesday, while Huskies kick returner Daniel Perry was named the conference’s special teams player of the week. Both players helped the Huskies blank the U of Alberta Golden Bears 42-0 last Friday at Griffiths Stadium. Lokombo had two interceptions and four tackles for the Huskies, while Perry returned nine punts for 139 yards. The Huskies return to action tonight, when they travel to Winnipeg to face the University of Manitoba Bisons. Four members of the WHL’s Saskatoon Blades are currently attending NHL rookie training camps. Winger Eric Florchuk is in camp with the defending Stanley Cup champion Washington Capitals. Florchuk was selected in the seventh round and 217th overall in June’s NHL Entry Draft by the Capitals. Florchuk will be joined at Capitals camp by Blades Norwegian import forward Kristian Roykas-Marthinsen. Roykas-Marthinsen was picked in the seventh around and 213th overall by the Capitals in the 2017 NHL Entry Draft. The Blades selected Roykas-Marthinsen in last June’s CHL Import Draft. Centre Chase Wouters is attending camp with the Tampa Bay Lightning as a free agent invite. Overage winger Max Gerlach earned a free agent invite to camp with the Arizona Coyotes. The Blades return to pre-season action on Saturday, when they host the Prince Albert Raiders at 7 p.m. at the Legends Centre in Warman. Brian Towriss’ legacy will be honoured on Sept. 15. I was back in the pages of the Saskatoon Express this week with retired legendary U of Saskatchewan Huskies football head coach Brian Towriss, who is a member of the Canadian Football Hall of Fame. The feature was an advancer piece for the “Thanks to BT” program that will be held Sept. 15 at the Saskatoon Field House and is being put on by the Huskies Football Alumni Club. As part of the program, Towriss will join former Saskatchewan premier Brad Wall and TSN broadcaster Darren Dutchyshen for a fireside chat about Towriss’ legacy. For those heading to the “Thanks to BT” function, you will likely be in for a treat. Towriss is a great story teller and names of players or recollections of big games will bring a cool anecdote. In my piece, I had Towriss reflect on his career with the Huskies starting from the time he joined program as a defensive end way back in 1974. The hardest part in writing the piece was deciding what to include and what to leave out due to space constrains. That is crazy to say noting that I still wrote a longer form story piece for the Express. Some of the interesting tidbits that I wasn’t able to include in the article was the fact Towriss attended a high school hosted by the CFL’s Saskatchewan Roughriders in order to get scouted in his Grade 12 year. He was recruited to join the Regina Rams, who were still playing in the Canadian Junior Football League, and was in camp with Rams before electing to join the Huskies. Towriss, who was born and grew up in Moose Jaw, decided to head to Saskatoon after getting into U of S’s commerce program, and learning from then head coach Val Schneider that the Huskies had money through a Roughriders scholarship to help the then defensive end attend school. 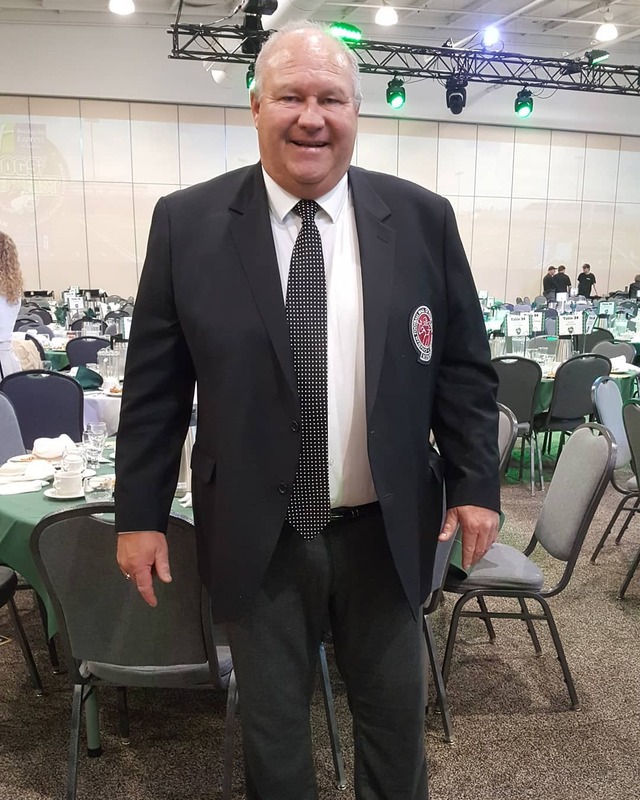 The 62-year-old Towriss reminisced about the fact TSN used to have a game of the week for U Sports football in the early 1990s, and those televised games helped bring the Huskies into national prominence along with their three Vanier Cup wins. I wasn’t able to fit that into the story as well. Towriss discussed what it was like to have a long succession of offensive linemen graduate from the Huskies and play in the CFL. That list includes current Huskies head coach Scott Flory, Kevin Lefsrud, Ben Heenan, Patrick Neufeld and Evan Johnson. I wasn’t able to get that into the piece either. He also talked about the disappointment in not being able to win a playoff game during his final seven seasons as Huskies head coach. I couldn’t work that into the story. Still, I was able to get a lot of cool recollections into the piece. In order to see what those were, you have to read the story, and you can do so by clicking right here.